The Annual Meeting of the National Monitoring Committee for Minorities Education (NMCME) was held in New Delhi today under the Chairmanship of Minister of Human Resource Development, Dr. M.M. Pallam Raju. The meeting was attended by the Members of the NMCME, distinguished Academicians, Activists, Administrators from Centre and State Governments and officers of the Ministry of Human Resource Development and Ministry of Minority Affairs. Dr. M.M. Pallam Raju, reiterated the commitment of the UPA Government to ensure access, equity and inclusion of the weaker sections and the minorities, including the Muslim minorities. He also emphasized the importance of education as the panacea to move up in the social and economic ladder and to assimilate in the national mainstream. Dr. Raju stressed the effect of the affirmative actions initiated under the Common Minimum Programme, the Prime Minister's 15 Point Programme and recommendations of the Sachar Committee to remove the backwardness of the minorities, including Muslims in education. He highlighted the increase in enrolment of Muslim children both at the Primary level (9.4% in 2006-07 to 14.2% in 2012-13) and Upper Primary level (7.32% to 12.1%) improving access under the Sarva Shiksha Abhiyan. Madarsas have been provided funds under SSA apart from free text books to 17.30 lakh students. 40,000 Madarsa Teachers were provided training and 8235 Madarsas were provided school grants under SSA. He also said that 9905 Madarsas were supported with 23146 teachers in 2012-13 under the Scheme for Providing Quality Education in Madarsas. He said that enrollment of Muslim students in primary education exceeded the share of Muslims in the country's population. And now the welcome feature was that more girls were coming to schools. In higher education, the ongoing schemes such as Model Degree Colleges, Polytechnics, Women Hostels and Skill Development Programmes are being implemented in the minority concentrated districts. He also said that process of establishing AMU Centres in Mallapuram in Kerala, Murshidabad in West Bengal and Kishanganj in Bihar is in progress. Minister also emphasized to establish new institutions in unserved areas under the New Centrally Sponsored Scheme Called the Rashtriya Uchchatar Shiksha Abhiyan. 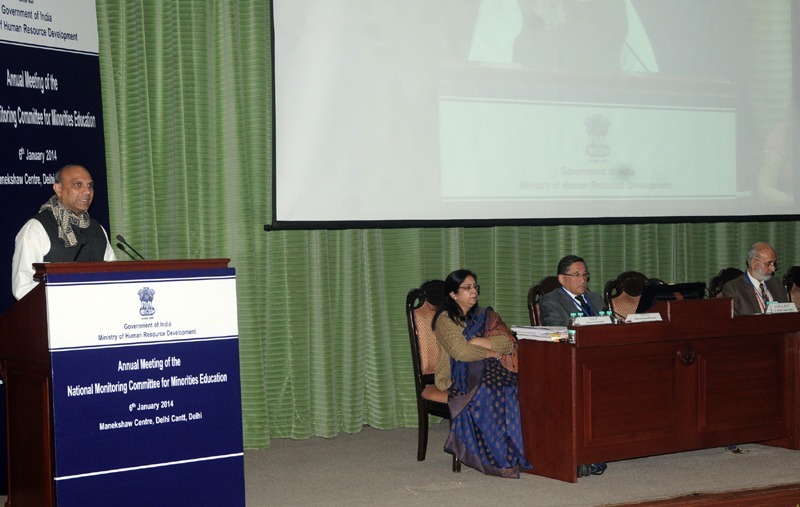 Dr. Raju stressed that greater focus to the needs of minorities' is given in the 12th Five Year Plan. SSA and RMSA will continue to be our main vehicles for social inclusion in the field of education. He said that 270 Model Schools have been approved in Minority Concentrated Blocks. He said that during 12th Plan we would be setting up 378 JNVs which are in great demand and priority will be given to MCDs. 196 JNVs will be set up in Special Category Districts including all Minority Concentration Districts. Dr. Raju appreciated the efforts made by the Standing Committee of the NMCME and said that steps are taken to implement most of the recommendations made by the Standing Committee. Scheme on the lines of HUNAR for skill development among minority girls in the age group of 14 plus. Maulana Azad Taleem-e-Baligan for imparting functional literacy to one crore Muslim adults in the age group of 15 plus. Establishment of Educational Hubs by co-locating KGBVs, Girls/Women Hostels, Degree colleges in selected towns/districts, which are educationally backward and having substantial Muslim concentration. Dr. Pallam Raju emphasized the importance of joint endeavours of all the stake-holders, Central and State Govts., and the community leaders for ushering in perceptible improvement of the minorities education.